After a very active day of redecorating, cycling, running and (somehow) a yoga lesson, the only thing I can still move with some coordination are my fingers on the keyboard, so let’s get into this week’s Makeover Monday challenge. It’s a map with 3D things exploding of it and while that’s not a good thing, one thing is for sure: It gets my attention straight away. Colors and some crazy shapes. Why are the 10 cheapest places labelled but none of the blue ones and 12 of the red ones? How is the coloring and categorization into good and bad determined? What percentage of someone’s take home pay seems to be a fair amount to pay for the mortgage? Why the trellis pie charts? A pie chart that adds up to 100% is easy to understand when it only has two segments. 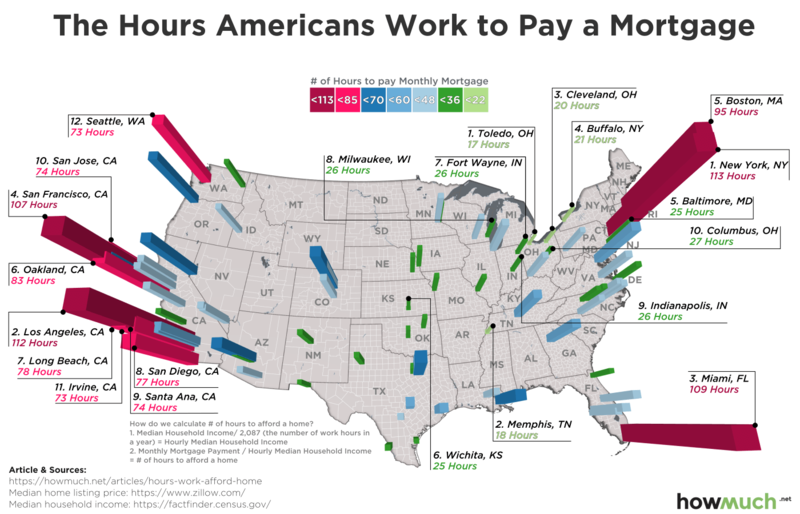 For example, New York and LA make it easy to see that ‘almost 3/4 of the working time is required just to pay the mortgage’ while in Oakland it’s ‘a little less than 1/2’ and in Richmond we’re at ‘about 1/4’. I chose Georgia as a font because of its newspaper look.